So I have a confession to make – turmeric is not new to me. However, the application I chose to use it in is very new to me. Over the years I have used turmeric in curry dishes and homemade salad dressings, but that’s pretty much the extent of it. I have yet to use it in a sweet dish – that is – until now. Turmeric itself doesn’t boast a ton of flavor so it can easily be used in both sweet and savory dishes. It has a bit of a peppery taste with a slight nod to ginger; so I decided to emphasize the ginger and pair it with orange. 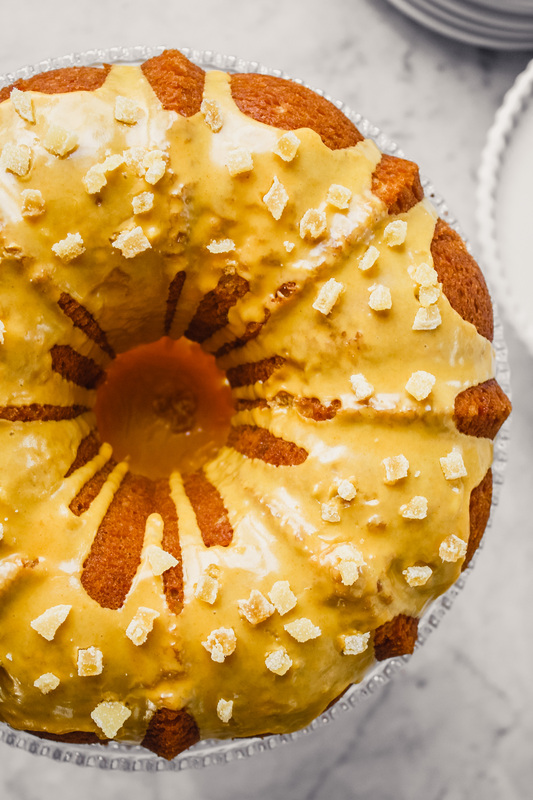 In this cake I utilize two different types of ginger to create a dimensional flavor: dried ground ginger and candied ginger. 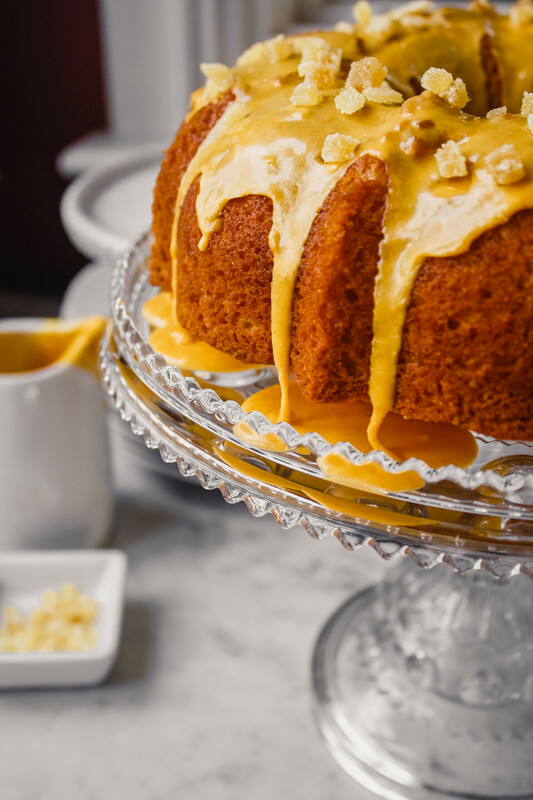 I incorporate orange zest and orange juice to cool down the spice and bring a bright sweetness to the cake. Turmeric is often used in foods for its stunning yellow color, and this recipe is no exception. 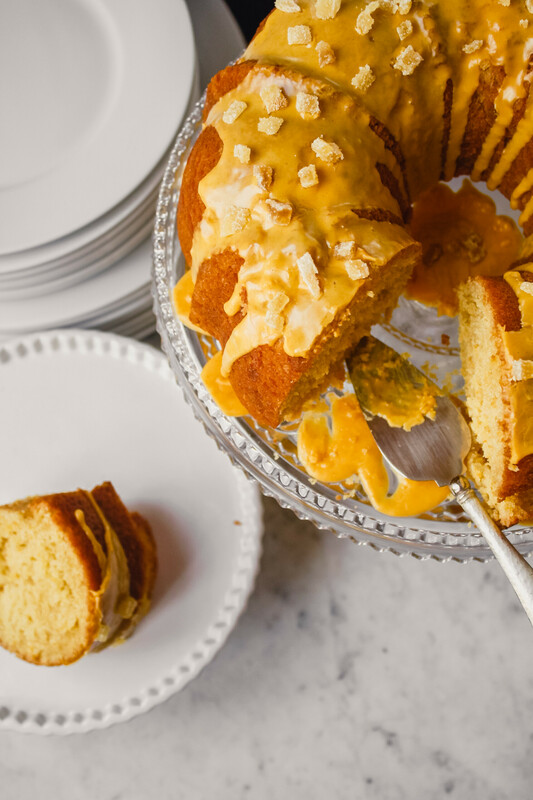 Turmeric, an all-natural food coloring, if you will, lends a luxurious color to the glaze. This cake is delightfully moist and full of flavor; it’s definitely a crowd pleaser. You may even find yourself nibbling on it for breakfast, enjoy! 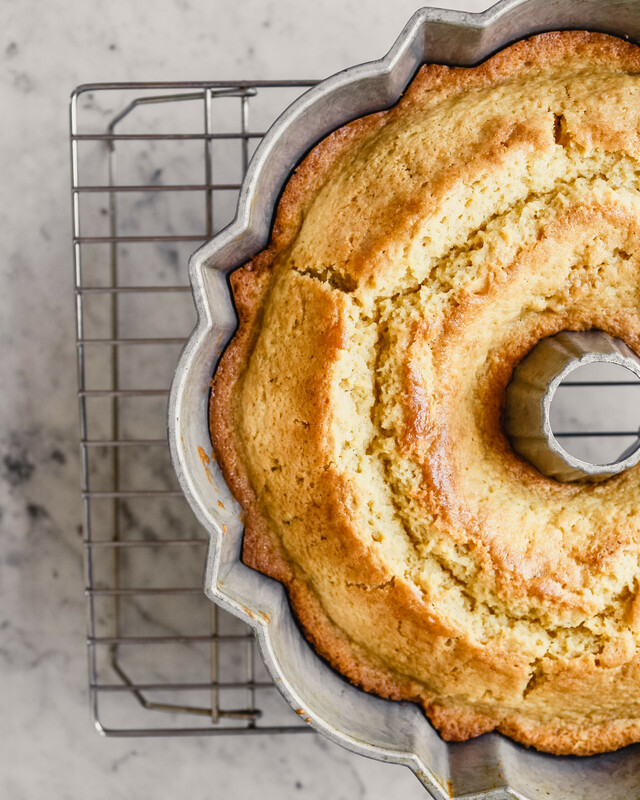 This cake is delightfully moist and full of flavor from orange and ginger. This cake is perfect for any holiday celebration! Adjust oven rack to middle position and heat to 350°F. Spray a 12-cup Bundt pan with non-stick cooking spray and set aside. Run a knife through the orange zest a few times to mince. In a medium bowl combine orange zest, juice, buttermilk and vanilla. In a medium bowl whisk together flour, baking powder, baking soda, salt and ground ginger. Using a stand mixer fitted with a paddle attachment beat butter and sugar on medium-high for 4-6 minutes until fluffy. Scrape down sides of bowl as needed. In a small bowl, whisk together eggs and yolk then add to butter mixture. Mix on medium for 30 seconds, scrape down sides of bowl and mix for an additional 30 seconds. On low speed and add flour mixture in three additions, alternating with buttermilk-orange mixture. 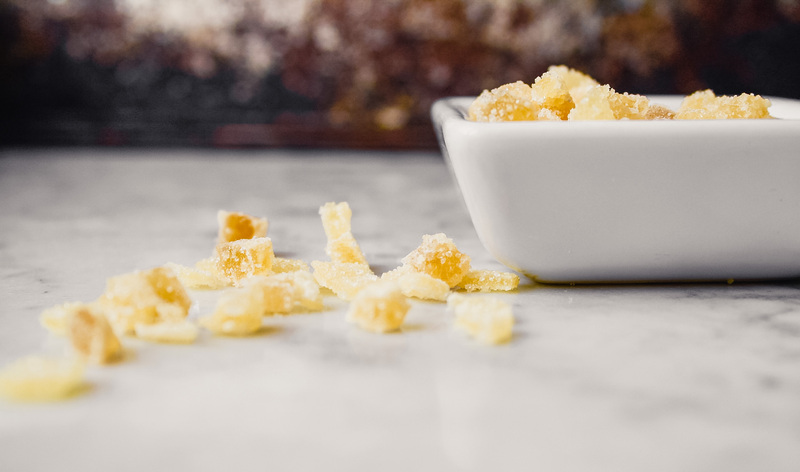 Mix until just combined, add ¼ cup plus 2 tablespoons of candied ginger (reserving the rest for garnish) and mix for a few additional seconds, until just combined. 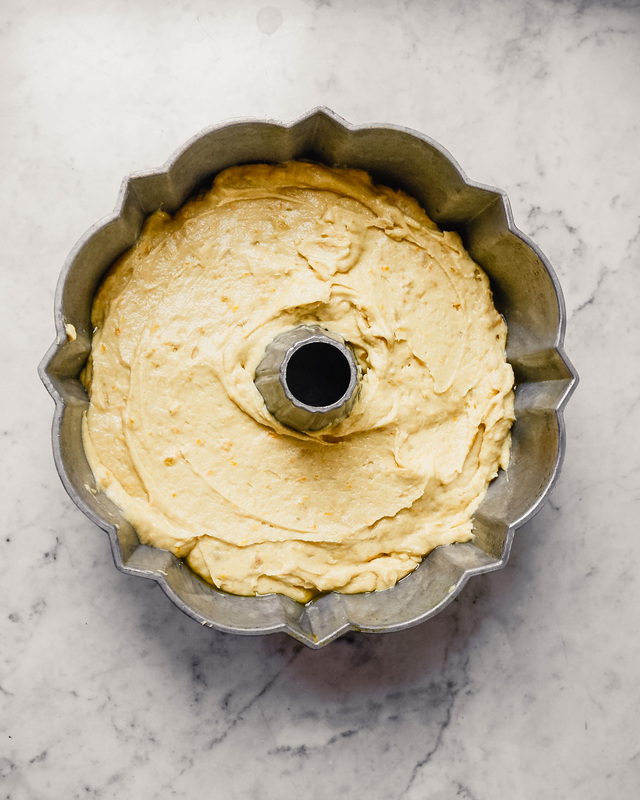 Transfer batter to prepared Bundt pan and spread into an even layer. Bake until top is golden brown and toothpick comes out clean, about 45-55 minutes. Remove pan from oven and transfer to a wire rack for 20 minutes. Reverse pan on a wire rack and remove cake. Allow cake to completely cool. Meanwhile, in a medium bowl, whisk together orange juice, milk, turmeric and powdered sugar. 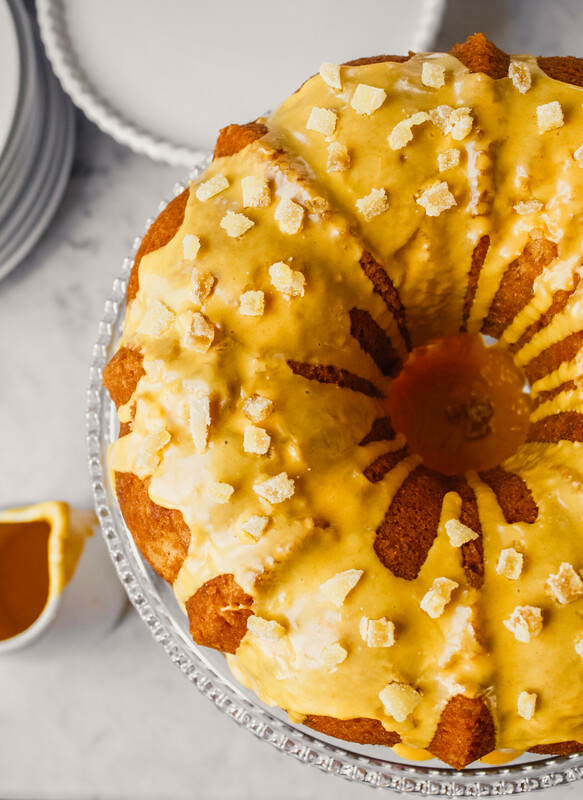 Once cake is cool, drizzle glaze over cake and sprinkle top with remaining 2 tablespoons of candied ginger.